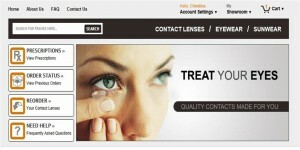 Acumenex makes it easy and effective for independent optometrist clinics to compete in today’s changing market. As the optical industry competition continues to grow, and business models need to adapt and change, our optical solutions are specifically designed to help small businesses take advantage of having the first opportunity to transform their patients into their customers. Our WebStore solutions incorporate the entire supply chain including distributors, financial institutions and insurance benefits. prescriptions on-line – directly from their optometrist. To learn more about this solution, visit www.getcanadianvision.ca (or click the logo).